It has been said that at spoken word performances of Grace Taylor’s poetry collection, Afakasi Speaks, the inspiration for Mother/Jaw, that “the poem is wrapped in the body’s movement, and the body’s movement is wrapped in the poem.” This integration of word and movement has been taken on its natural progression by choreographers Jahra ‘Rager’ Wasasala and Grace Woollett, in what is simply a stunning multi-faceted performance. From the moment Woollett enters the stage, the tone and quality of the show is set. Her internal struggle and its physical manifestation is emotionally resonant, articulate, and truly engaging. Wasasala is full of attitude and points of view, bringing full dimension to her characters, and Vivian Hosking-Aue evokes a strong sense of the dramatic irony of performance ritual. While predominantly a dance piece, the spoken-word component of Taylor’s original work is incorporated into the performance, with Alisha Anderson delivering a perfectly cadenced monologue. In addition to the performers’ physical interpretation, musicians Addison Chase and Christoph El’ Truento, who sit visibly side-stage throughout the performance, have orchestrated a full-bodied soundscape that not only compliments, but also enhances them, and consequently provides a sense of completeness to the theatrics of the show. Even without having read Taylor’s collection, there is a sense of truth to and respect for the source material. It’s important for the performers, therefore, it’s important to us. 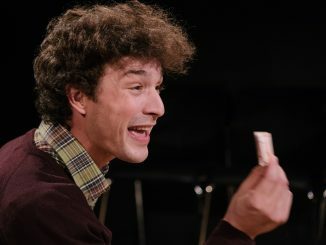 There is a range of themes throughout the show, from identity and genealogy, to forgiveness and acceptance, and many more, which are all explored to their full extent within the context of the show, resulting in an intense yet cathartically satisfying production. 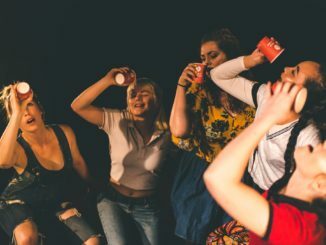 It’s shows like these that raise questions and provide endless discussion that are most difficult to examine in a fringe review – hopefully just got to experience it for yourself. 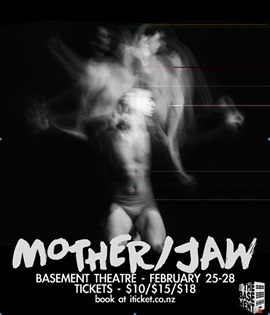 Mother/Jaw played at The Basement as part of Auckland Fringe. For details see The Basement.